Indoor soccer is a fun and dynamic form of the sport, full of explosive plays and high-tempo action. 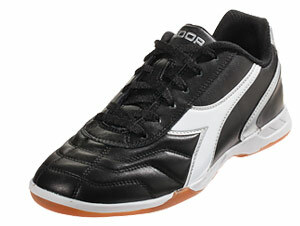 Playing indoor soccer well requires specialist shoes with the right mix of grip, support, and weight. 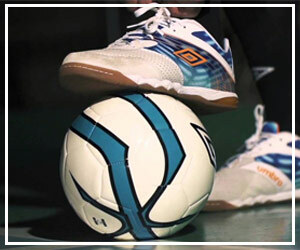 In this post, we will review 10 of the best pairs of indoor soccer shoes on the market and then discuss some of the most important things to look for when shopping for indoor soccer shoes. 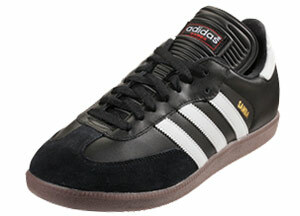 The Samba is, as the name suggests, a very classic design. It comes in white on black or black on white and is made of leather and gum rubber. 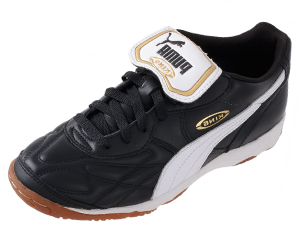 The Samba has very good grip and comfortably supports the ankle as well as feeling light and fast. It does well on more or less any surface. The Samba is a versatile shoe and anyone who can afford it can benefit from it. It does cost a little more than some other options, but it should last through determined play and carries a good brand and a low-key design. 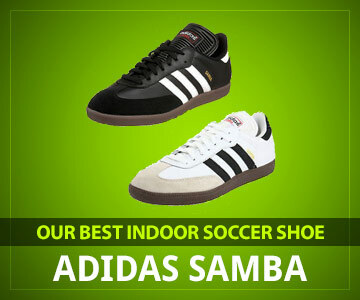 The Samba is known for its longevity compared to other light athletic shoes. Some people like to take out the arch support component attached to the bottom of the insole and find that it is more comfortable that way. The Samba Millennium feels quite a lot like the original Samba on the floor. The most striking difference from a consumer perspective is that the leather is tough and rigid at first. This shoe will probably take 3-4 play sessions and some light use around the house to fully break in, which is longer than other shoes of this genre. The Millenniums are an alternative to those who like the Samba feel but want something with a modern touch, or who prefer a tougher leather in their tops. The Millennium has the same general strengths as the classic. 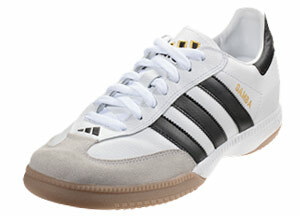 The Samba Millennium is a new version of the classic Samba. It has a few differences from its inspiration that set it apart. First of all, it has a lower price due to the use of synthetic leather. Next, it has a slightly more modern design with a little more personality in the coloration, especially for the base white model. You cannot talk about Adidas without mentioning Nike, its great rival. It has mesh in the top to allow air to pass through and a foam insole for support and comfort, it uses the same type of gum rubber as the Sambas and has similar longevity. It does have a strip of foam that is visible along the bottom. The biggest performance difference for the Gato5 is the mesh, which is strategically placed to cool your feet and reduce sweating. Not only is this more comfortable, but it also makes it harder to slip and shift inside the shoe. The Gato5 is a good option for those who are drawn to its black base, no-stripes design option, the mesh, or the look around the outsole. 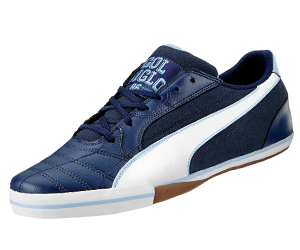 It shares many characteristics and materials with the Samba because it is the same style of shoe. The Gresca 604 from MUNICH is not as well-known as other models and brands. However, it has a special quality all its own due to the additional foam padding in the insole. The Gresca feels a little heavier than some other soccer shoes. They also come in an interesting blue and white design that is a significant departure from the classic black and white looks. The Gresca has very good grip and deep padding that provides extra support. It does have more material and therefore weight compared to some other shoes. It has thicker siding to add support there as well. The Gresca is recommended for athletes that prefer more support or who have a history of knee or ankle problems. It is a little harder to find, but the increased comfort is worth it if you need more than just the rubber sole. The Speedtrick tends to feel different due to the higher weight, deeper pad, and better grip. If you are used to the heavier style of shoe, then this falls into that category neatly. Otherwise, it may be offputting. Try it out in person if you are new to it. The people who will get the most out of the Speedtrick are similar to those who benefit from the Gresca. 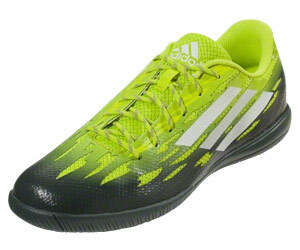 It is not quite as heavy and has a little more grip with less padding, but it is still heavier than a typical shoe. The Speedtrick from Adidas is a shoe that adds some features that were previously only found on Nike shoes, like mesh for airflow, thicker sides, and higher grip. The shoe is more substantial than some other Adidas offerings. It also has a solar green and purple design that sets it apart from the traditional Samba look. 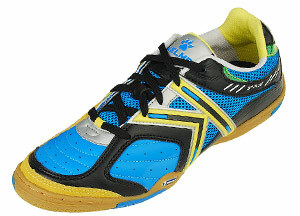 The Star 360 is the result of a collaboration project between Kelme, the shoe designed, and Michelin, the tire company. Michelin supplied the rubber sole and Kelme did the rest. The shoe has many vibrant, bright designs, strong traction, and a low profile. It also has thicker sides and mesh under the laces. It tends to run large in size. The Star’s 360 grip is good, but not unusually so – the influence of Michelin does not seem to have produced any groundbreaking innovation. There is no support in the shoe for heel or arch, which may be good or bad depending on your preference. The Star 360 is designed with indoor soccer in mind. It has a good balance of ankle support with a light weight thanks to the low profile. The Star’s mesh could be more open, but it is passable. It is recommended for anyone who wants to try a lighter shoe but prefers thicker sides, or those who love the wild and colorful designs. 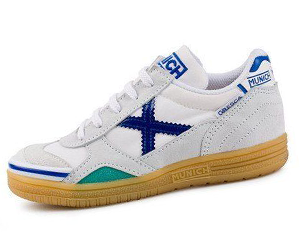 Diadora is a smaller brand that still has a reputation for quality. The Capitano is a traditional indoor soccer shoe that comes just in black and white, although it is a little more interesting than the Adidas stripes. The shoe is 51 percent true leather and 49 percent synthetic leather. 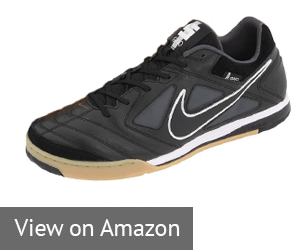 Unlike many other indoor soccer shoes, it fits to size accurately. It is thick and a little heavier than average with no mesh. The Diadora grips well and the thick sides make it easy to push off laterally. The lack of mesh means it tends to get sweaty on the inside faster than shoes that do have mesh, which can be annoying. If you do not need mesh and prefer a thick shoe, the Capitano is a good choice due to convenience. It is easy to size with no guesswork about sizing up or down. It should last for a good amount of time relative to other shoes at this price point. The King is on the heavier side due to all the extra material for support. While this can make it more comfortable, it would be good to see some mesh to help counteract the weight, because you tend to sweat more with a heavier shoe. This shoe is a great choice for a heavier shoe due to the helpful support, and the textured rubber sole is an interesting way to get more traction. They are comfortable for people who have wider feet, and Adidas and Nike tend to be on the narrower side for indoor soccer shoes. PUMA is quite a popular brand. The King has a few special features that. It has textured rubber on the sole for more grip, an included ankle lining, a thicker sole at the heel for extra support, and a decorative stitching pattern. It comes in just one color scheme – black and white. The tongue folds down over the laces. Nike returns to the list with the inexpensive all-leather Tiempo II. It is quite a basic shoe in terms of design, but has a few features that separate it from the rest. The rubber sole is textured as with perforations instead of having a mesh at the top, but it has a similar effect. 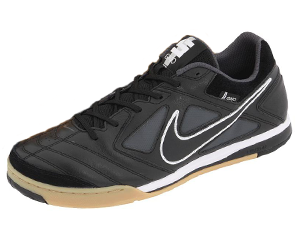 The Tiempo II grips well on the floor and provides a small boost to ball control as well. 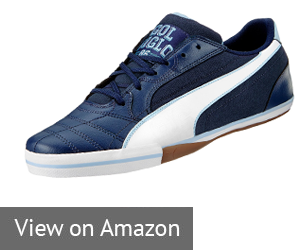 It is comfortable, but not as much as some of the thicker shoes, and does not have any specific support features. The tongue is short and stays out of the way during play. 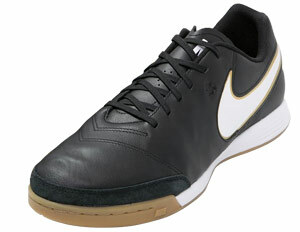 The Tiempo II is a good basic shoe with a few twists to the sole design. It is a good option for anyone who wants to get a simple shoe and fits well into Nike’s builds. PUMA makes the last appearance on this list with the Momentta. 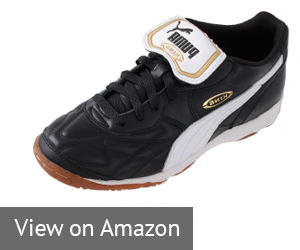 The Momentta is PUMA’s budget indoor soccer. It is made of synthetic leather and synthetic rubber. The toe is reinforced with an extra bumper. The Momentta performs a little worse than some other shoes- the synthetic leather does not grip as well as natural, and the tongue is placed so that it tends to press into the front of the ankle. The toe bumper is a good addition because it adds cushioning to the front where you often hold the ball. 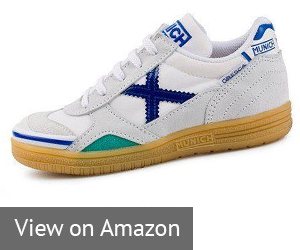 The Momentta is recommended for someone new to indoor soccer who does not want to invest much money into shoes at first. They deliver acceptable performance at a very attractive price. The comfort level is enough to play long sessions, but the shoes might not last more than a couple of seasons, if that. Like any other shoes, indoor soccer shoes should be built to last. It’s unfortunate that many of the materials that are lightweight and flexible tend to be less durable. You’ll need to find a balance where the shoe won’t fall apart but can still perform its role effectively. There are some key areas to keep an eye on when considering durability. In indoor soccer, the lateral movement and acceleration puts a lot of stress on the connection between the top of the shoe and the sole. So this area must be strong to avoid having the two come apart. The shoe also has to be tough around the ankle, because that is the center of where support is needed during lateral movement. Paradoxically, an indoor soccer shoe has to be lighter than a sneaker or other normal wear shoe, but it will undergo more force and wear and tear. Always read the reviews of any indoor soccer shoe before you buy it to see if there are complaints about it breaking or falling apart too early. The more you play, the more you should be concerned about durability and how it affects the lifetime of any pair of indoor soccer shoes you buy. The two key roles of the shoe are first, to provide enough traction for you to move and accelerate quickly, and second, to support your joints as you move. The first role requires the right kind of sole. This is generally at least partly rubber. Rubber can grip the playing surface, but doesn’t add too much weight. This is a good thing because a heavy shoe will slow you down and throw off your kicking motion and footwork. The sole performs the same role as the cleats on an outdoor shoe, so make sure the rubber has good coverage, grip, and weight. Try to test out the shoe and run and change direction in it to see how it feels. As far as support goes, soccer is already tough on the knees and ankles because it demands so much acceleration, and indoor soccer on a smaller pitch is even more extreme. The typical indoor soccer shoe is very low-topped, but it does have a top ridge that should rest right under your ankle joint. This supports you without restricting movement. It is also a good way to tell how well the shoe fits – if it comes up too high over your ankle or ends too far below it, you need a different shoe. Don’t pretend that the design doesn’t make a difference. You want a shoe that you think looks good. The standard and most basic designs tend to be black and white stripes. However, you can find versions of some models that are at the opposite end of the spectrum with much more involved colors and patterns. You probably already have a feeling about what kind of design you like for your shoes, but it’s a good idea to look at lots of different options anyway. You never know if you might find one that attracts you and that you never would have known about if you had not taken the time to check it out. Some designs are iconic and classic, while others are more modern. It is becoming more common to see greater color variety on the field now, but you can choose whatever design you want. Be aware that some shoe models will come in many different colors and patterns. But others might have just two or even only one version. The design can help you break a tie between two similar shoes or just eliminate a model that you don’t like at all. For just about every player, the most important characteristic is getting bang for your buck. This is connected to durability and the other traits as well. A good shoe will last so you do not need to replace it. A bad one falls apart and needs replacement sooner than expected. A shoe with good value will cost a reasonable amount of money, and one with bad value might charge a lot for needless features. Try to do some market research and get a feel for the common cost of particular features and aspects, such as the materials used in the top and the sole. That way, you can learn to spot when a brand is overcharging for something. It’s a good idea to put a limit on your spending as well, although in general it is not hard to find a good set of shoes at a price that makes sense. As you saw in the list of products we reviewed, quite a few pairs fall between $50 to $100. If you see something outside that range, you should look at it closely to see how the manufacturer justifies the price. As you can see, there are a lot of options and you don’t need to break the bank to do well in terms of indoor soccer shoes. It is a very good idea to try them out in person if possible, because much of it comes down to the subjective feeling of grip and weight that is hard to evaluate without putting on the shoes. With this guide, you have seen some great options and you now know a lot more about these shoes so you can find more prospects on your own. Good luck! Brian Stock, shoe lover, sales seeker, trendsetter. 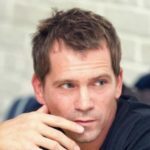 I'm always in search for good shoes companies and workshops, so I've started Bestshoesmix to share my experience with you guys. Read more.